The flamenco singer Estrella Morente will be performing at Sadler’s Wells on Monday 18 March 2013, presenting her latest recording called Autorretrato. 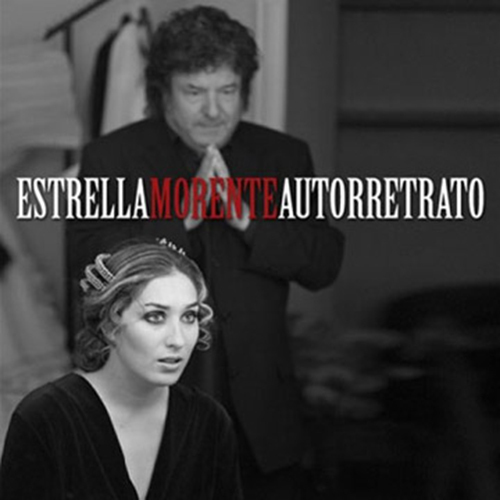 The CD cover shows a photograph of Estrella Morente in her dressing room at the Teatro Española in Madrid, with her father, the flamenco singer Enrique Morente (1942–2010) standing behind her. When he died unexpectedly on 13 December 2010, he still had a few more voices to add to certain tracks but the final track, Adagio, was complete. Autorretrato (Self-portrait) (EMI Spain) was released in October 2012 and is her fourth studio recording. The guest artists include guitarists Paco de Lucía (Seguirillas de la Verdad), Tomatito (Bulería del Amado), Isidro Muñoz – the brother of Manolo Sanlúcar (Como la Corriente) Vicente Amigo (La Habanera Imposible and En un Sueño Viniste), her grandfather José Carbonell ‘Montoyita‘ (a Lola) dedicated to Lola Flores, Alfredo Lagos (Fernando Camisa), Antonio, Josémi and Juan Carmona (Ketama) (Tangos Toreros and La Estrella), as well as the Cuban jazz musician Alain Pérez (Cuba – Cái), Pat Metheny (En tus Sueños) and the composer Michael Nyman who has orchestrated setting of poems by San Juan de la Cruz (Pregón de la Moras and Le Di a la Caza Alcance). On the final track, Adagio, Estrella Morente sings with her father, Enrique Morente. Estrella Morente – Autorretrato from Flamenco Festival on Vimeo. Estrella Morente’s performance is part of the annual Flamenco Festival London at Sadler’s Wells from 15–27 March 2013. Sadler’s Wells, Rosebury Avenue, London EC1R. Tel. 0844 412 4300.